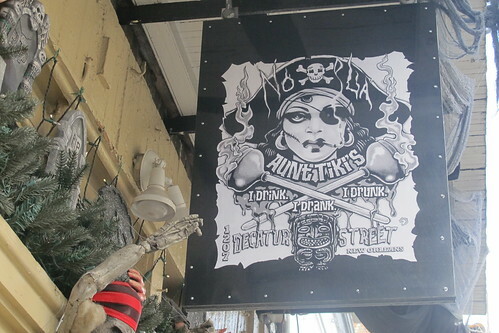 A few months ago when we visited New Orleans, Chad and I were walking along Decatur Street in the French Quarter on our way to Cafe du Monde when I stopped in my tracks, pointed up and shouted: “Tiki!” We’d serendipitously stumbled on Aunt Tiki’s, which had tiki not just in the name but also on the logo (along with a lady pirate and crossed flaming toilet plungers…). I snapped a quick photo of the sign and we continued on our pursuit of beignets. By the next day I’d mustered up enough courage to go back and trespass on what seemed to be a locals’ dive. 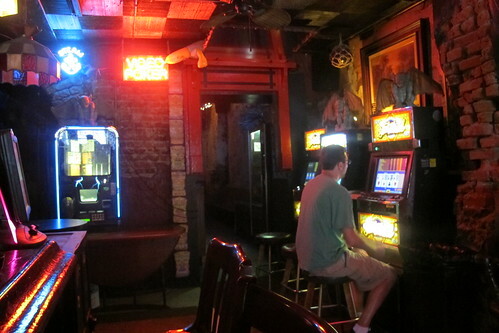 The “Star Wars” cantina song was playing on the juke box when we walked in, which seemed sort of appropriate. 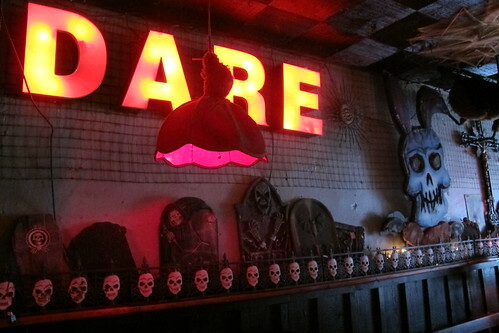 The decor is definitely more on the spooky side with all the plastic gravestones and skeletons around. 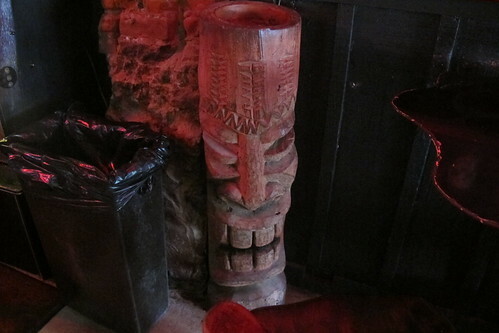 Nonetheless, there are still a fair amount of tiki-related things, including at least one carved tiki. 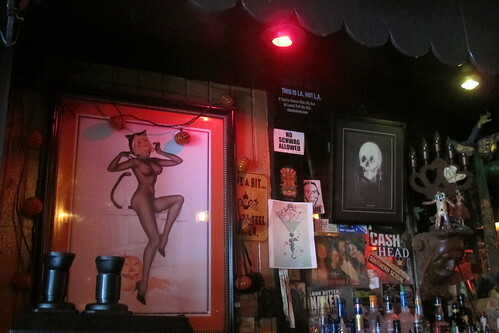 On the right just as you walk in is an awesome mural (made by a local artist) with a winsome wahine on a beach by a tiki shack with a smoldering volcano in the background. 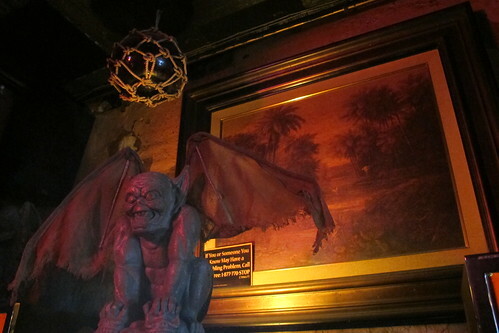 A small glass fish float hangs above the gargoyles perched on the video poker machines, and in the light of the neon beer sign I noticed a faded Party City tiki banner along the doorframe in the back of the bar. It was sweltering outside that day and not much cooler inside. However if you went through that doorway you’d find this secluded little space where you could actually feel the air conditioning. 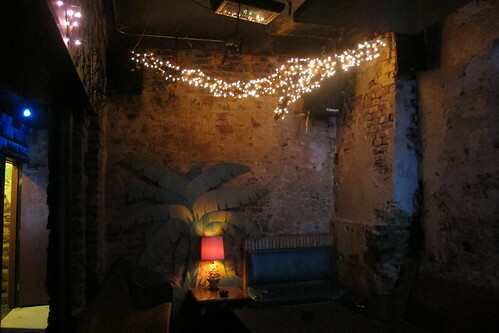 I was intrigued by its exposed brick walls, fairy lights and tropical touches like shell lamps and paper palm trees. Rum and pineapple juice is the closest thing to a tiki drink served here. The other patrons seemed to prefer PBR and shots of Fireball cinnamon whisky. There are no beers on draft, so your best bet is probably a bottle of Abita. 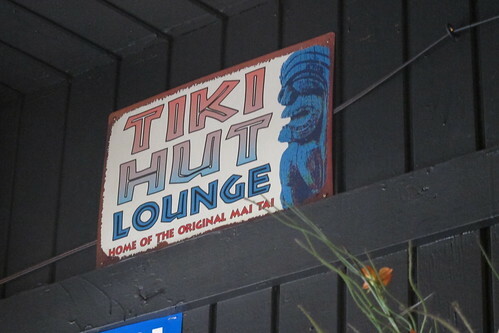 Aunt Tiki’s keeps the doors open and liquor flowin’ 24 hours a day, so it’s sort of like Frankie’s (except it’s nothing at all like Frankie’s…). 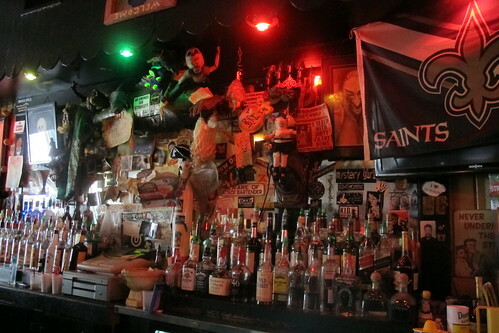 Aunt Tiki’s would be a perfect place to start your Halloween revelry — and there’s a small vintage shop next door — but if you’re looking for a tiki bar in New Orleans, you’d be better off visiting Tiki Tolteca at Felipe’s Taqueria (or Latitude 29 when it opens!). Sacre Bleu! I have been exposed in print and picture!!! Geez, what could be better than tiki and Halloween! I am going to check this place out when i finally make it to LA. But for now i guess i will just settle for L.A.
It’s an interesting place, for sure! I am the one that made the “This is LA. not L.A.” stickers. I did it to promote my book on the NOLA Punk scene. The shop next door is owned by the same guy that owns the bar. He sells antiques. ” Aunt Tiki’s” get it! ;) Always thought it was a good spin on the name. 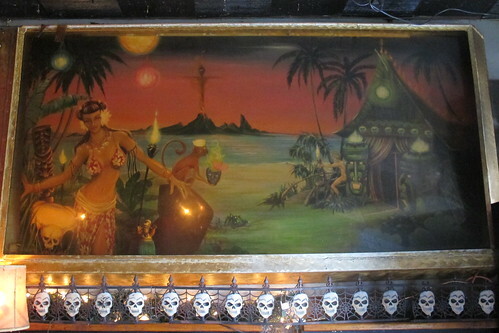 Also that Hawaiian mural as you walk in, is from the original Tiki bar at Pontchatrain Beach. Parts were sold off when it closed and a few pieces from it pop up from time to time. Thanks for sharing more background on the bar! The flaming toilet plungers are a reference to a decorated Mardi Gras throw.